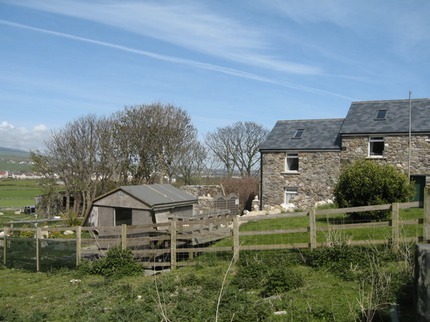 Glendown Farm, which extends to about 300 acres, is situated on the Truggan Road, Port St. Mary, yet is virtually in Port Erin, and a newly proposed housing development threatens to encroach on the boundary about 200 metres away from the farm. The layout of the land, which is not really conducive to the dairy farming that is carried out, runs from the Truggan Road to the Howe, up to Cregneash, over to the Chasms and back up to Fistard. There are nine Landlords in all with the smallest piece of land leased being an acre. The road from Port St Mary to Cregneash runs almost through the middle of Glendown, so the cows have to be moved twice a day along 3/4 of a mile of this road. However, the road is kept reasonably clean after they've been along by the road sweeper! In 1986 the herd numbered 58 cows which was quite a big herd for those days - because the Qualtroughs had a very fine milk round in Port St Mary. This was their main enterprise at the time, and had been for a number of years. It ceased to exist during the 80's (@83/84) because dairy farming with a milk round is not particularly lucrative - a low price per pint, staffing situation, vehicle maintenance costs, and costs of keeping the officials happy (cattle passports, + lots of other paper work)! So, during 1986 (after one of the worst summers on record in '85 - hay stocks were very poor) changes were made. A silage pit was dug to make silage - pit silage is a lot cheaper to make. The land is quite rocky and they get super crops of silage. This was fairly revolutionary for a farm that had made hay for generations! A pipeline milker was also installed, followed by a hang down milking parlour in about '88. The herd has now increased to 85 cows. A good overview of "the Farm" - personally have fond memories of working on the milk round in the 80's - I am sure that my uncle William remembers fondly me learning to drive on the Howe round !! I know that the farm has always been the spiritual focal point for our section of the family and this continues with Jane and Derek on the farm. I also have fond memories of James on the milk round in the 80's. I'm sure the van would too if it was still around! Great to see the details of Glendown on the notice board. Who provided the details? Was it taken from my husband's radio interview on Manx Farming for Manx Radio(Sunday 19/1/2002). The property now provides accommodation.